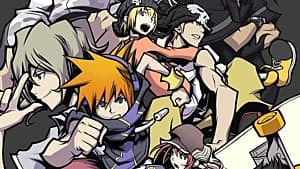 Released back in 2007, The World Ends With You quickly cultivated a cult fanbase thanks to its unique anime, urban-street-culture presentation and original use of the DS touchscreen. Since then, TWEWY has been released on iOS and the characters have made an appearance in Kingdom Hearts: Dream Drop Distance. I was one of the many people who missed out on the JRPG when it originally released, and I thought it was a good time to see if it still holds up now that it's on the Nintendo Switch. 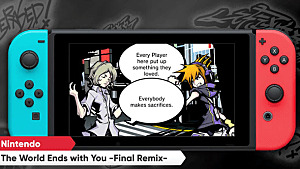 The World Ends With You: Final Mix edition touts itself as the definitive version of the beloved cult hit, complete with HD graphics and a new control scheme. 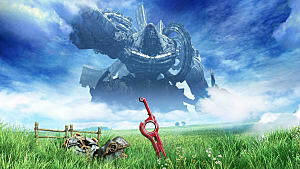 After playing it, I can say it's one of the most difficult to talk about games I've ever had to review. 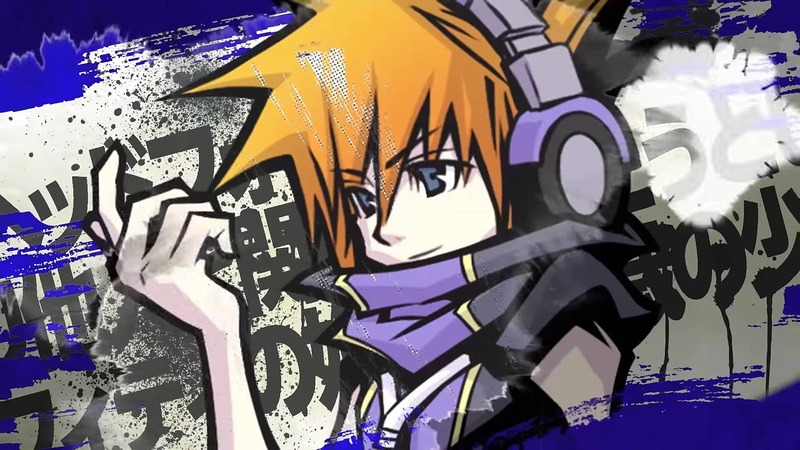 TWEWY puts you into the shoes of Neku, your typical angst-ridden, anti-socialite. While Neku starts off as a wet blanket, seeing him grow from hateful misanthrope to (somewhat of a) paragon is at the core of the story -- and it's mostly well done. 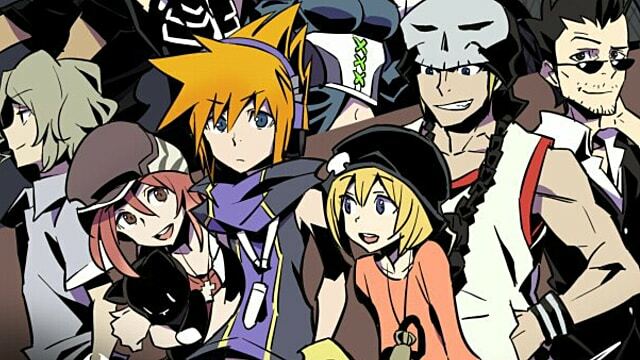 The cast of colorful side-characters helps liven things up and make endearing Neku's anti-social personality worth the trip. The writing can expositional and it runs into cliche story beat's you've seen in countless anime, but it's still a decently-told tale. 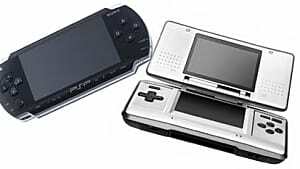 What TWEWY does do well is embrace a unique style and presentation. The streets of Shibuya are oozing with urban culture and the citizens that inhabit the city give life to this virtual re-creation of Japan's version of Time Square. Tetsuya Nomura, known for his work on Kingdom Hearts, not only produced TWEWY but was the art and character designer. 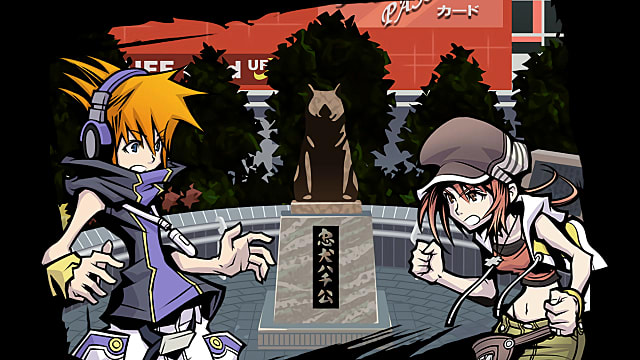 His work is on full display and mixes well with the street-art style that TWEWY is known for. Colors are a bit more muted than in other games in the genre, but that only adds to the game's overall immersion. The final mix version adds more detail to the backgrounds and models. Characters, in particular, look less like 16-bit sprites and more like hand-drawn models, similar to what you see in a manga or comic book. The environments also look much crisper and less pixelated than past versions, giving a game with tons of personality even more. There's still no game that matches TWEWY's sense of urban fashion and, even on an HD TV, the game still looks great despite its age. Adding to the game's presentation is the fantastic soundtrack. From hip-hop to bits of J-pop, the game's music is almost 100% vocal and never feels out-of-place. It's so good, you might just want to get it on iTunes (it'll be stuck in your head for a week. 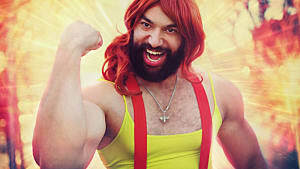 You're welcome). The final mix contains a remastered version of the original soundtrack, with updated tracks and melodies, that are even more pleasing to listen to. But, if you prefer the original version, you can always opt to change it in the options menu, which is a nice touch for returning fans. 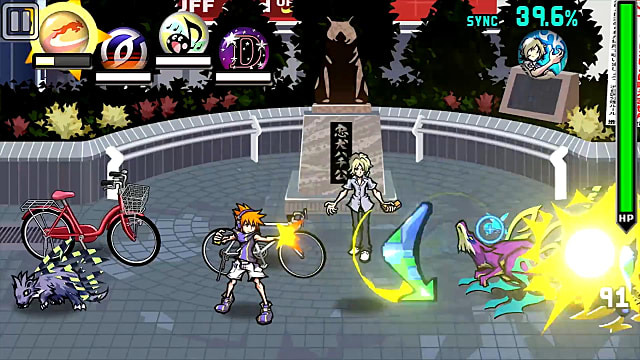 Combat in TWEWY takes place in real time, and will make use of either one of the Switch's Joy-Cons when docked, or the touchscreen when in handheld mode. Either control style you choose will have you swiping, moving Neku and his partner via pins you collect. These powers can range from simple melee slashes to various forms of kinesis. You'll set enemies aflame, zap them with lightning, or even throw objects on the field. You can only switch between three pins powers in combat, but you can change which ones you want while in the pause screen. Combat starts off basic, but slowly ramps up. Mixing and matching pins to your playstyle is generally a good time thanks to the flashy feedback you get. It all makes for a unique combat system but one that's begging for either a traditional control scheme or one that makes use of a stylus. In my experience, it's better to not use the Joy-Con at all. The docked control scheme is just awful, as the Joy-Con's Gyro-sensor just isn't that responsive to keep up with the hectic action. 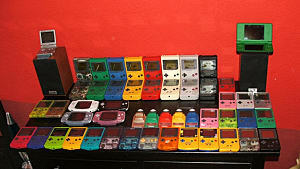 There's no way to turn off motion controls, so you're stuck with them whenever you're playing on the TV. Constantly flailing your arm to emulate a stylus just doesn't work and makes the game nearly unplayable. It's a shame that for a system that has the moniker, "you can play anywhere", gaming on the TV is a pain. Fortunately, you can play with the game's touchscreen -- and it works well. 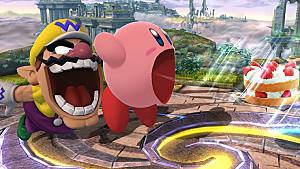 The game will occasionally misinterpret one touch for another, but that never becomes too much of a problem. 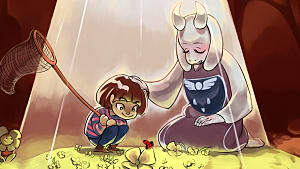 What can be problematic, though, is the disconnect between story and gameplay in the exploration sections. An early mission, for example, will have you looking at a statue and trying to figure out what's wrong with it. You'll know what you have to do with it, but the game won't let you interact with it unless you search for a thought bubble that tells you what you already know what to do. Despite these nuisances, TWEWY is still a fun game to play -- even after all these years. There are very few games that contain the style and gameplay that has yet to be re-created and it's easy to see how it gain such a strong cult following. 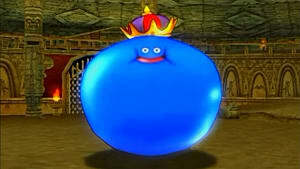 However, it sits in this weird state where it's both the best and worst version of the game. It's a hard deal to accept, especially at the $50 price tag. The game looks better than ever and plays well, so as long as you keep out of docked mode. If you only have a Nintendo Switch, it's worth picking up. Just beware of some tacky choices here and there.